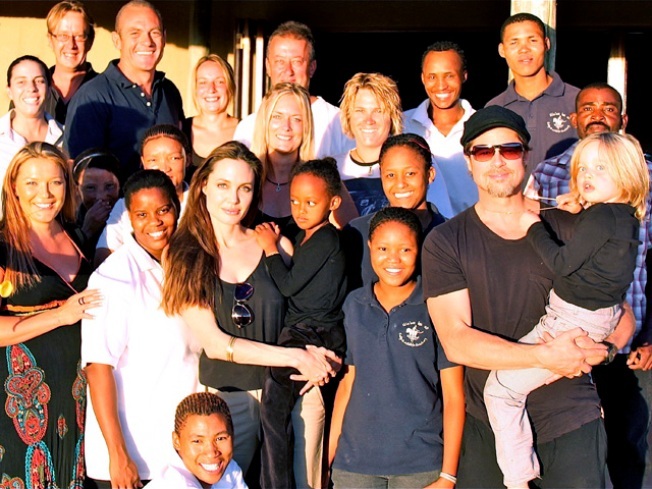 Brad Pitt and Angelina Jolie spent Christmas at an African wildlife sanctuary, where they left a $2 million donation under the tree. The Hollywood power couple was in Namibia, where daughter Shiloh was born in 2006, and stayed at the N/a'an ku sê Wildlife Sanctuary, which takes care of injured animals like cheetahs and lions. The sanctuary is run by conservationists Dr. Rudie van Vuuren and his wife Marlice, according to People magazine. "We continue to be impressed by their hard work and dedication to the people and conservation of the land and wildlife of Namibia," Jolie told Us Magazine. According to the U.K.'s Press Association, the stars and their six kids saw a leopard get reintroduced to the wild, and Dr. van Vuuren work on a wounded wild dog. Selected Reading: People, Naankuse.com, Us Magazine.